When I first started as a Digital Product Manager at Breast Cancer Care, I was aware that I had a limited window of impartiality, so I decided to use it to conduct a front-end audit of the site. I wanted to see what some of the main challenges of the role would be before I knew anything about our digital history or ways of working. At the end of the audit, I’d examined every forgotten corner of the site, identified the areas I felt presented the biggest user experience challenges and created a list of seventy-six questions I wanted to spend the next few months gathering answers to, either internally or through user research. One of the biggest issues I noticed was our tendency to create microsites for every new campaign or fundraising activity. Internally this was taking a great deal more time than it needed to, and meaning quite small pieces of work were stealing the team’s attention for months at a time. Externally I worried about the user experience implications of treating each activity as separate from the site as a whole, particularly as the microsites were so difficult to navigate to and from, and often contained a number of subsidiary pages that took users away from the actions we wanted them to complete. Talking to people around the organisation, I realised a lot of this practice had developed because the site offered internal teams no good alternative. We didn’t have a sophisticated suite of content types to cater for the various ways we wanted to engage the outside world in our work, which left staff little choice but to begin almost entirely from scratch each time. To solve the problem we started working with the design agency William Joseph to create a new suite of content types, so that the site could better cater to user needs as well as our internal requirements. The first type we began working on was a flexible, modular and mobile-first campaign template, which is currently being used to showcase eleven of Breast Cancer Care’s key campaigns and fundraising activities. Through this approach we’ve found an enormous reduction in the time and resource needed to create engaging content during key campaigns, activities and other peak periods. We’ve been able to up-skill digital champions around the organisation to create more of their own content and reduce reliance on agencies to create landing pages on our behalf. Brand-wise, the site has benefited from a vast improvement in standardisation and consistency, which proved difficult to achieve with so many agencies each interpreting our brand guidelines in slightly different ways. Finally and most importantly, we’re now in the second year of using our new suite of content types and have seen a marked improvement in engagement and conversion to our key activities and campaigns. This post was first published via Just Giving. I was on holiday in Africa this week, leaving product behind and heading for the mountains and the sun. Whenever I’m away I tend to keep a sneaky eye on anything involving developers, because issues that arise there are usually the most complicated to fix, and I’m the one who knows what shade of yellow all the balls in the air are. Mostly I decide things can wait, but occasionally I’ll step in if I see conversations heading towards a consequence that hasn’t been accounted for. When that happened during my holiday this week, it made me wonder whether imperfection is inherent to product management and whether that might not just be a reassuring fact, but also a positive one that leads to better overall results. Playing out on Podio this week I could see my team trying to fix something in a way I knew would break something else. They’d done all the right things; figured out the problem, consulted with a developer, kept people informed and agreed a fix. When I jumped in and got them to revert their decision, it made me stop to notice that they were dealing with a problem that, in the timeframe, didn’t have a correct answer – there were two paths and the one I pushed them to take was still wrong, just less wrong than its alternative. These are the types of decisions I make all the time, but on each occasion a tiny bit of me feels like a failure; I didn’t find the third way, I couldn’t get everybody to win before the clock ran out and I had to settle for something less than what I wanted. Watching a great team of capable people going through the same process this week made me not only resolve to cut myself a little more slack in this area, but also gave me the opportunity to reflect on the benefits of that rock and hard place situation. There will be a third way for next time and getting back to work on Monday will allow me to find it, but will also give me something I wouldn’t have had if the issue had been easier to solve. These trickier problems and craggier paths to success lead to the pondering, consulting and late night googling that make us good, better and then the best at our jobs. They’ve led us to find the third way more often than we’ve ever stopped to notice. The development is gradual, but the only way to achieve it is to keep clashing with the issues that don’t have an obvious answer and use what we learn to keep moving forward. General Assembly at the moment are running a series of free introductory seminars in various specialist areas. They’ve been great, I’d definitely recommend signing up to a couple if you have the time. Last week I went to one on user experience design and I thought I’d share a highlight of the session. Usually when a speaker says “I’d like you to get into pairs” I get an internal sense of dismay. After all, if I relished opportunities to make awkward chat with humans I didn’t know, I wouldn’t be working in digital. However, what I have realised over the last five years is how much I love user research, and fortunately that was the task we were set in this session. 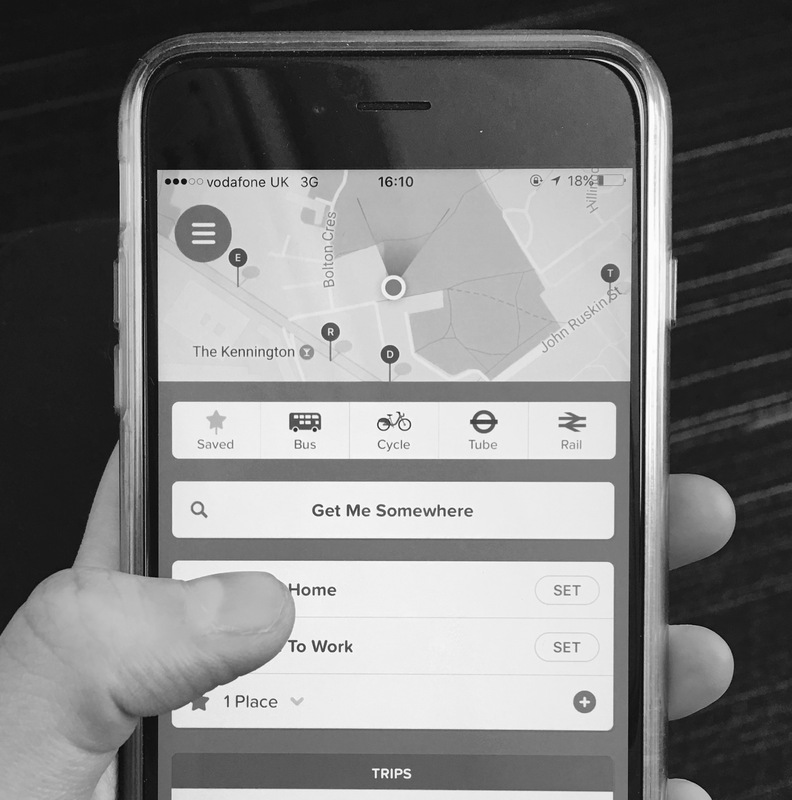 We had five minutes to imagine we were working on improving the Citymapper app and run user testing with the person next to us about their experience of using it, in order to make informed recommendations about what could be improved. The most interesting challenge with my partner, I’ll call him Adam, was that he was very distrustful of apps generally, particularly apps that asked for access to his location. He felt ill-informed about how his data might be used, and uncertain about the location-driven apps he downloaded having access to other areas of his phone. Fine was enough for Adam when it came to maintaining his digital privacy. When I asked him how he would get around outside of London, he said he would ask for directions or take a printed map of his journey – that was how strongly he felt about protecting his identity online. Thinking about the app design brief, I wanted to get to more than ‘fine’ with Adam, I wanted to know what would make a digital experience great for him. So I started asking him about his favourite non location based app. It took him no time to get out his phone and show me a radio product he loved, and the most interesting thing about this was how much of what he said could be applied to the development of the Citymapper app. On the radio app’s home screen, there were six content categories – things like ‘popular now’ ‘stations’ and ‘favourites.’ Though the ‘favourites’ option was in the bottom left corner, not the usual position of popular actions, Adam went straight to it and started showing me around. This indicated how important personalisation was to him, something really useful to explore with users in the context of the Citymapper app. I then asked him to show me how I might use it as a first-time user, to get an idea of the journey he might have been on when he first signed up, and what he liked about that. He showed me the search function and commented on how good the app was at returning exactly what he was looking for really quickly – another useful insight for apps more generally. The interesting thing about that search function was how it remembered his latest query and then made suggestions on what his next one might be. He said he found this feature surprisingly accurate and that it had introduced him to new stations he wouldn’t previously have come across. It was clear from this that he had begun to trust the app and let it guide his behaviour and propensity to try new things – another great example of something that could be explored more generally in the development of other platforms. The whole task was a great reminder that good digital experiences come from putting the person before the product. To learn these things in five minutes made me really excited about some user testing I’m running for Breast Cancer Care next week. If you haven’t done any for a while, I hope this can be some inspiration! With everyone on holiday over the summer, we’ve had some time at Time to Change to do a few nice UX improvements that have been on the list for a while. My favourite has been getting the site AMP ready on blogs and news stories. Working in comms, news sites amping their articles has been really useful for me. When stories break I want to know the details fast, and as a commuter, I’m often on a train with terrible signal when those ‘need to know’ moments happen. Getting quick access from my phone has taken a lot of the frustration out of browsing for information, and gradually I started to think how great it would be if everyone got on board with amp – including us. In April I went to Brighton SEO and heard a talk from Dom Woodman about getting started using amp with Drupal, WordPress and Joomla. The talk was great and gave me the confidence to know we could do it, as well as being a good opportunity to ask questions about wider uptake beyond Google’s ‘top stories’ carousel. Dom’s advice was to get going and sure enough, a few weeks after we completed the sprint, Google blogged an early preview of their plans to expand amp. As the Guardian worked in partnership with Google in order to get amp working on their top stories, I picked them as a model for how I wanted it to work on our site. One thing I noticed most prominently was the consistent, engaging use of images in every post. At first I wondered how they were able to incorporate images without compromising the integrity of a high speed article, then I noticed the <amp-img> tag and other similar solutions, which we would also use as part of our own installation. Previously, feature images weren’t something we’d used very often on the Time to Change site, so this has been a real bonus in getting amp ready and is something we’re now thinking about expanding to other content types across the site. Installation and testing was fairly standard and took the usual month we allow to get new things done. One compromise we did have using Drupal was that amp is only compatible with page content types, which means our comments module doesn’t pull through to amp articles. If you’ve recently installed amp yourself, I’d be interested to know how this compares to other CMS’ and I’ll be looking out for how Drupal 8 develops as amp popularity grows. This blog is about removing redundant, out-of-date and trivial (ROT) web content from a large site. Before I start, I should say that a much more sensible person would have got an agency to do this. At several points during the process (which I started in October) I’ve thought I was being far too stubbornly INTJ about the whole thing and it would be easier to hand it over to a bigger team of people who could work on it full-time. But it was interesting and technically achievable – I’ve come to realise I can’t say no to anything that can be described like that. During my first year at Time to Change I’d slowly been discovering a lot of ROT content. A lot of it was unnavigable, which I think was part of the problem – whoever created it had left, forgotten it was there or for whatever reason abandoned it to float around the website without its parents. It happens in any organisation, perhaps particularly in busy charities where everyone’s working at such breakneck speed that the phrase “just get it up there and we’ll deal with it later” can become common by necessity. The tricky thing is that nobody does deal with it later, because we’re all straight on with the next cripplingly urgent thing. And so it continues until there are are over 5,000 out of date pages that no-one but Google has time to notice. A crucial part of this was that we didn’t have a system for forcing parent page assignation, so bypassing this step and saving everything as a page in its own soon-to-be-forgotten-about right became inevitably common practice overtime. A further contributor to the problem was that we had no processes in place to deal with content that had a known shelf-life, so community event listings from 2011 continued to sit there gathering dust in the absence of an agreed way of unpublishing and redirecting them. How did we address these? As well as dealing with the content that needed to be removed, I’ve been keen to make sure we improved our set-up to negate the need for such a time-consuming audit in the future. With a bit of development, now when people add content to the site they’re asked to assign a parent by default, and an auto-generated url now inherits that breadcrumb trail as standard. To deal with the event listings, I’d hoped for a module that would manage these automatically based on a set expiry date, but the slightly more laborious alternative of manually setting an auto-unpublish date when approving the listing and then using Siteimprove to pick up the 404 for redirecting is a fine substitute. Incidentally, Siteimprove has also been great for us in a number of other ways, and I found you can haggle them down fairly substantially from their opening service offer, I’d definitely recommend them. How did we ascertain the ROT content? Although we can export all pages on the site from our CMS, I wanted to make sure we knew which were the high performers so we were making removal decisions within an informed SEO context. With that in mind, I picked the slow route of exporting them 5,000 rows at a time, in rank order, from Google Analytics. Once I had a master spreadsheet of 17,000 pages, I looked through the first hundred or so to identify any top performers that might also fit the removal bill. Happily there weren’t any I could see that ticked both boxes – top performers were, as you’d hope, well used and positioned pages, or personal stories and news articles that remain indefinitely evergreen. With that reassurance locked down, I could sort the spreadsheet alphabetically as a way of identifying groups of similar pages – e.g. blogs, news stories, user profiles and database records which we wouldn’t want to remove. It also identified duplicate urls and other standard traffic splitting mistakes. I then selected and extracted these from the spreadsheet, cutting the master down to around 10,000 pages. Next I wanted to filter out the dead links, because we now had Siteimprove to pick these up and a weekly digital team process of redirecting highlighted 404s crawled by the software, so they didn’t need to be included in the audit. As GA exports urls un-hyperlinked and minus the domain, I needed to add these in. I used the =concatenate formula to apply the domain and the =hyperlink formula to get them ready to be tested. I then downloaded a free PowerUps trial and ran the =pwrisbrokenurl dead link test for a couple of days over the Christmas holidays. It’s worth saying my standard 8gb laptop struggled a bit with this, so if you have something with better performance, definitely use that. PowerUps divided my data into broken and live links so I could filter out the broken ones and be left with an updated master spreadsheet of every page that needed auditing by the team. There were just over 6,000, which we divided between us and checked on and off over several weeks, marking them as either ‘keep’ or ‘delete’ and fixing the url structures and parent assignation as we went. That process identified 1,000 relevant and valuable pages to keep, and 5,000 redundant, out-of-date and trivial ones to remove. Past event listings make up a large proportion of these, but I’d also say you’d be surprised how many other strange things you find when you do something like this! Now we know what we’re removing, I’m going to get a temp to unpublish and redirect it all, which I hope will take about a week. From there I’m going to look into how we might go about permanently deleting some of the unpublished content, as a spring gift to our long-suffering server. Once that’s done we can move onto the content we’re keeping, so the next phase of the audit will be about ensuring everything left behind is as fit for purpose as we can make it – I expect this to go on until the end of the quarter. Over a year ago now, I blogged about Samaritans Radar, a tool created by the charity that caused a lot of controversy amongst the strong mental health community on Twitter and elsewhere. I agreed with a lot of the issues people raised, though for me privacy wasn’t top of the agenda, my worry was more around the obligation it placed on individuals to take responsibility for the safety and welfare of others – something our Government should be doing and, increasingly, isn’t. Since then, Samaritans have been working on an alternative, something I was vaguely part of in the early stages, attending a couple of round-table feedback meetings and sharing my own experience of managing these issues on social media, in an interview format with the Samaritans digital team. 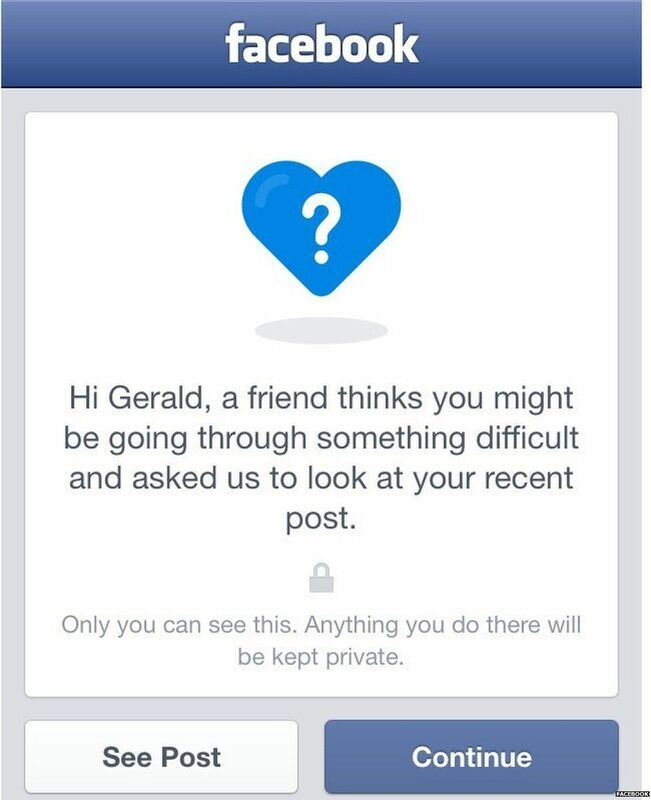 This week, Facebook have launched their suicide prevention tool in the UK, which takes elements of what the Samaritans wanted to achieve with Radar but looks, at face value, to be safer and better. 3. Support options which connect them (anonymously and by choice) to the Samaritans, who are trained and able to provide the right help. They also get the option to connect with a friend – something that might feel more possible once you know for certain that at least one person in your network is worried about you. 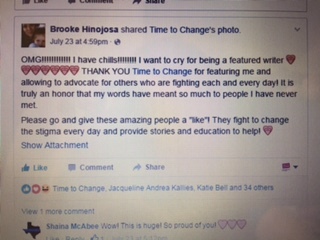 In general I think there is a place for providing interventionist support within social media platforms, but I do have some reservations about the term ‘prevention’ and its potential to reduce the pressure on other agencies to create a society where 6000 people a year don’t attempt and succeed in taking their own lives. 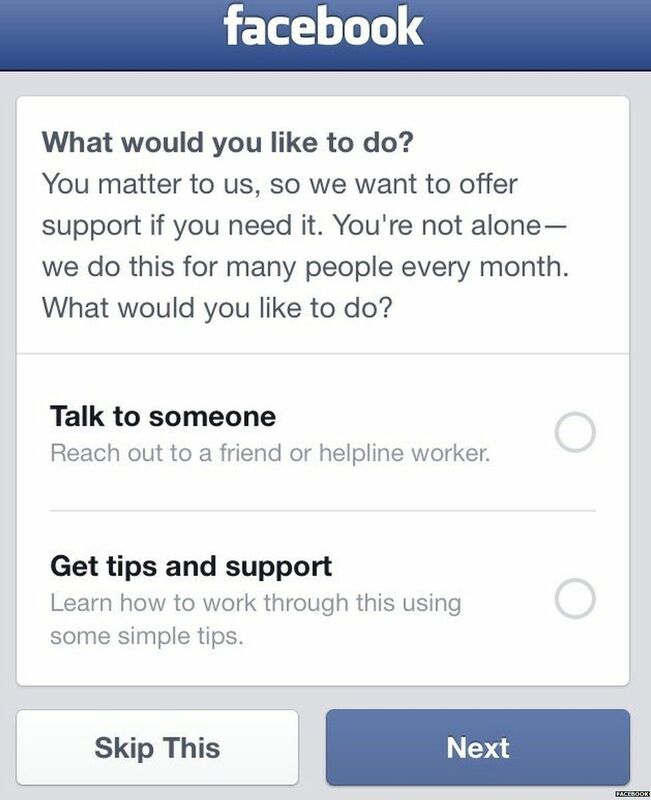 I’m also wary of the passivity of asking for help in such a vulnerable and indirect way – if people need help they should believe in our systems enough to know they’ll get it, but since so much evidence into crisis services suggests that they won’t, people are left posting on Facebook and hoping somebody cares enough to respond. Image credit: Felicity Morse, BBC Newsbeat.